I'm reading James Watson's 2003 Book "DNA The Secret of Life" with which Katherine Mendlesohn at the Traverse was good enough to gift me before my showing there the other week, and lots of responses to it, and to its style, occur to me. I've just finished the first chapters on the "heroic" (my word) era...which are a reminder of not only the physical and chemical questions that Crick and Watson, Franklin and Wilkins were asking, but of the physical processes of research itself...of the distinction between the Gene/genome as "model" and as "molecule"...of the thing in itself...and what you need to do to it before it gives up its "secrets". 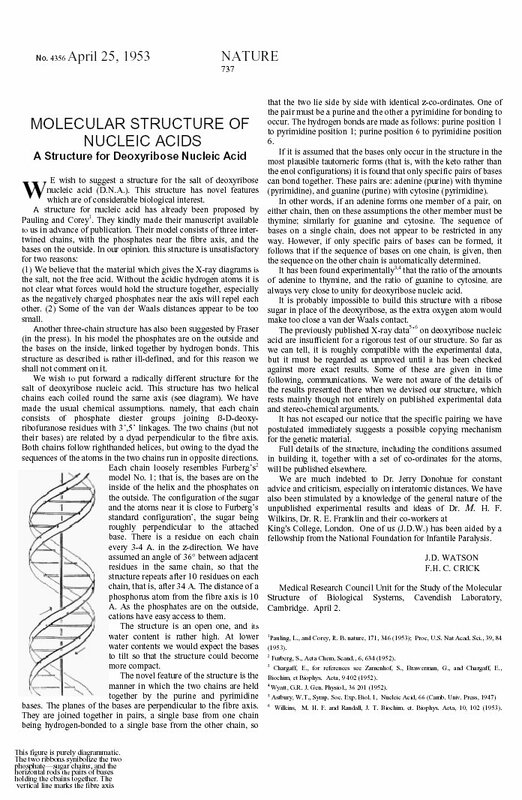 This is the original paper they wrote in "Nature" as published in April 1953. The first thing that strikes you, of course, is how short it is, how pithy for such an earth shaping discovery. Now, we're used to a mythology of instantly shifting paradigms...and assume that after April 1953, no one ever thought of life the same way again...just as we also tend to assume that no one thought of life the same way again after November 1859 and the Origin of Species. Truth is that NOBODY got it...or almost nobody....not for a while. What needed to happen even in the world of science was that this theoretical model for inheritance had to be physically demonstrated and explained...which meant that a pathway had to be found from the splitting and copying of the DNA molecule on the chromosomes inside the nucleus to the manufacture of proteins by amino acids in the ribosomes of the cell... (in the "other" bit of the cell, the cytoplasm) ...all this had to be tested for, confirmed and explained. RNA being necessary to life in the distant past and still necessary now demonstrates, incidentally, that evolution has thrown the cellular system together with the same disregard for "design principles" as our bigger more familiar "bodies" - which are obviously jerry-built botch jobs... the more that the cell is understood the more it is clear that it too is an accumulation of improvisations on a theme of adaptation. Took till about 1966 to fix the process in more than a handful of minds as being the way things actually were. 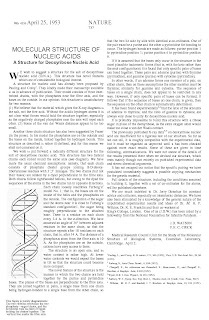 In the meantime, in 1954, James Watson and George Gamow (one the great characters of 20th century science...and, like Crick, a refugee from nuclear physics to biology post Hiroshima) formed the RNA Tie Pin Club...assigning each member one of the twenty amino acid acronyms...and a tie -pin...marking their mission to think about how all this might work. The club numbered Crick and Watson and Gamow as members, of course...and other figures who became legendary in Molecular Biology, like Sydney Brenner...but also Richard Feynman and Edward Teller...who were, of course, physicists. There was plenty of room in this very tiny, very elite club for these luminaries...and both the elitism and the smallness of the group are redolent of the way things actually happen in science. And now the club, in a way, is a much more open, much more amorphous gathering of social scientists and politicians and even playwrights trying to work out what it all means...asking ourselves are we using our specialisms to interrogate the meaning of genomics...or is genomics, rather more disturbingly, that is interrogating us. Is it possible for any of us to go on with any of our ethical and moral enterprises without being given pause by the questions asked of us by "This View of Life"? And most of us, still, when it comes to an overview of the science and its development, are next door to clueless...while the number of people with a comprehensive, nuanced overview of the Science of Genomics, and of its rampantly expanding technology -leave alone of its implications as process and story, as well as information...is still a pretty tight little group. Perhaps there is no one who can see the whole thing anymore, so intense is the field's own specialization. Most of Watson's 2003 book, though, seems to be about the human story of the science - not just ideas, but how those ideas were sweated for, negotiated and sold. I'm looking forward to reading his take on the politics...and boy were there politics...of the genetic industry as it developed in the 70s...and culminated with the evangel according to Bill, Craig and Tony in the White House in the year 2000 ...just before Bin Laden and the banks between them cancelled the future. In any case, here is the man himself, maybe still wearing his tie pin, maybe a candidate for the maybe mythical role I describe, telling his own story in his own scurrilous style, at the opening of Ted Talks in 2005. Start From Anywhere or All Roads Lead to Genome.